US shoppers will soon be able to enjoy McDonald's coffee outside the fast-food chain's outlets, following a deal with Kraft that will allow the McCafe brand to be sold in grocery stores. The brand extension, which mirrors moves by Starbucks in 2009 to sell its Via-branded coffee outside its own outlets, will allow a variety of packaged ground and whole-bean blends, as well as "on-demand" single cup servings, to go on sale from early 2015. McCafé is made from 100% arabica beans. It will be available in variants including Premium Roast, Breakfast Blend, Hazelnut, French Vanilla and Premium Roast Decaf. On-demand single-serve cups will come in three varieties. 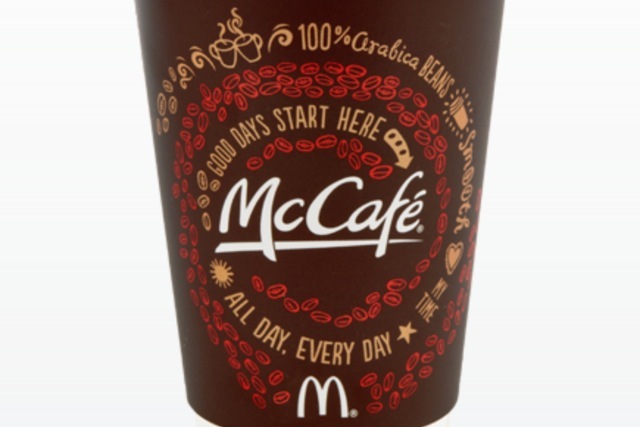 Retailers planning on stocking McCafé coffee include supermarkets and drugstores. Greg Watson, McDonald’s senior vice-president of US menu innovation, said: "We understand there is huge demand for at home options and we've built great success with our McCafé coffee in restaurants. So, it was a natural next step to provide customers with McCafé coffee to enjoy in their own home. "We have always been committed to serving delicious, high quality beverages at a value and we're happy to provide consumers another great way to enjoy McDonald's McCafé coffees." Nina Barton, Kraft Foods’ vice-president of coffee, said: "In a competitive category that is growing rapidly and changing every day, this new partnership with McDonald's represents a whole new era in the world of at-home premium coffee. "This partnership will allow us to leverage each company's best-in-class capabilities, putting us in a prime position to drive further category growth and deliver one of America's largest, fastest-growing coffee brands to coffee lovers nationwide."